Get students to design innovative new products and present them to the class. Of course, the lion and the cheetah are big cats, just like the tiger, but what the headline writer wants us to understand is 'Tiger's not a lying cheater' (it's been alleged that he was cheating on his wife with an 'events planner'). The animal theme is continued in the sub-headline. An ape is an animal such as a chimpanzee or gorilla, but the expression 'to go ape' means to become very angry (or mad as they say in the US). Apparently, Woods' wife smashed the car window with a golf club—supposedly to rescue her 'semi-conscious' husband. This is an excuse for a golfing pun since the car was a Cadillac (nickname Caddy), and a caddy is a person who carries a golfer's clubs around the course. Are you still with me? Here the word 'birdie' is used with a double meaning. A birdie in golf is a score on an individual hole that is one stroke below par. But birdie is also the diminutive of 'bird'—a slang term for a young woman. Let me know if you come across any more Tiger puns. Note the use of 'but' to mean 'except'. And the play on the word 'chef': the name of the appliance and the French word for 'cook' (or 'cooker' as my students will insist on saying). CNN's Susan Candiotti reviews the events that transpired Thanksgiving night at Tiger Woods' Florida residence. This cartoon by Morten Morland from The Times refers to Tiger Wood's car crash in the early hours of Friday morning. Details of the accident are still sketchy but the golfer's car reportedly hit a fire hydrant and tree as he left his drive at 0225 local time—possibly following an argument with his wife. Possibly over an affair with an events planner. The cartoon shows Woods playing a game of crazy golf. The ball has the word 'image' written on it— clearly a reference to Tiger Woods' clean-cut image, which has probably been irreparably damaged by the affair (Tigergate?) The crazy golf course features various elements from the story: the angry, golf club-wielding wife, the alleged mistress/lover (represented by an alluring leg), the tree, the fire hydrant, the car (a Cadillac SUV), and the policeman (Woods has cancelled three interviews with the police about the accident). The caption is a play on words: crazy golf (the game) and crazy golf (a comment on the whole affair). It will be interesting to see how this story will affect the Tiger Woods brand and his marketability. His previously 'perfect' image has certainly been dealt a serious blow. The other question is will his golfing game suffer? What is certain is that this story will run and run. A standoff (also stand-off) is a situation in which neither of two opposing groups or forces will make a move until the other one does something, so nothing can happen until one of them gives way. • A 26-year-old man armed with a knife and was arrested Friday night after a six-hour standoff with police. Here is the CNN Student News for Monday 30 November. Click on the links to view a transcript. Rodney Stanger is clearly a master of disguise—or a hamster. See more worst photofits here. A man who lived for a year without spending any money said today that it has been the happiest time of his life and he intends to continue. Mark Boyle, 30, has lived for the past 12 months as a true 'freeconomist', leading a self-sufficient lifestyle in a caravan in Timsbury, near Bath, growing his own food and reusing junk that people have thrown away. He says he has not spent a penny and has become a happier person, and today pledged to continue living without cash. He cycles everywhere, his phone only takes incoming calls, he has solar-powered showers and cleans his teeth with toothpaste made from washed-up cuttlefish bones. He either grows or forages for his food and gets his clothes from bins or from the Freecycle website. That sort of lifestyle might be possible for a single man, but I don't think it would be feasible for a family. And if the consumer society didn't produce so much rubbish, Mark would have had a much harder time of it. Still, the way things are going, we may all have to become freeconomists in the future. Good news: at last the US and China have announced some emission targets. This cartoon by Schrank from The Independent on Sunday provides an ironic comment on news that the US and China have announced targets to limit carbon emissions ahead of next month's climate summit in Copenhagen. Unfortunately, it's a case of 'too little, too late' for the Asian family in the cartoon, whose home has already been flooded. If someone is vetted, they are investigated fully before being given a particular job, role, or position, especially one which involves political or military secrets. • The rogue policeman who killed five British soldiers had never been vetted by the Afghan authorities. This afternoon I went to see Capitalism: A Love Story, the new film by Michael Moore, in which he looks at the causes and consequences of the 2008 financial crisis in his own inimitable style. Love him or hate him, Michael Moore's films are always very watchable, and Capitalism is no exception. However, if you've been following the news (or reading this blog!) over the past year and a half, you probably won't learn much which is new. (One thing I didn't know was that major US companies such as Wal-Mart routinely take out life insurance policies on their employees, standing to collect hundreds of thousands of dollars if they die. They call this "dead peasants insurance".) And the film concentrates almost exclusively on the US—you wouldn't think the rest of the world had been affected by the crisis. As usual, there's some great archive footage—the section on Ronald Reagan is probably worth the price of admission alone. Heaps better than the original. This cartoon by Peter Brookes from The Times refers to Dubai's debt crisis. We see an Arab man sitting on the ground begging. Beside him is a sign which reads "26 wives & 58 kids to support. Please give generously". In the background, we can see Dubai's skyscrapers in varying states of construction. 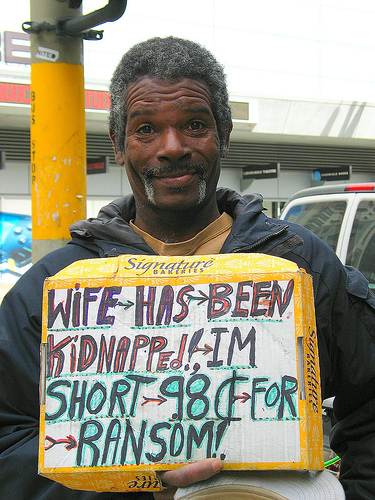 Normally a beggar's sign would say something like 'Wife and kids to support'. The joke is based on the common stereotype of the Arab man having many wives and children. However, according to Wikipedia, Islam allows men to have up to four wives at a time, so 26 is something of an exaggeration. 1. A landslide is an election victory in which a person or political party gets far more seats than their opponents. • Equatorial Guinea's President Teodoro Obiang Nguema vowed Sunday that he would win the presidential election set for November 29 by a landslide. 2. Tories is another word for the UK Conservative Party.